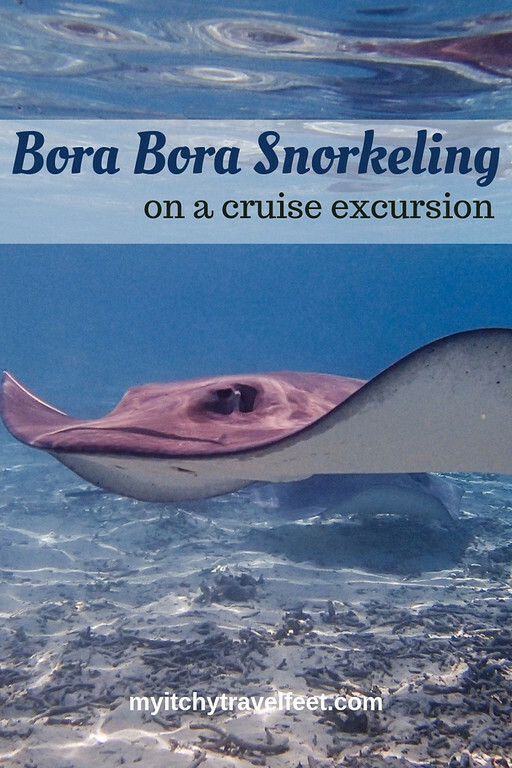 Expedia.ca is partnering this look at a Bora Bora snorkeling shore excursion. When a cruise ship arrives in Bora Bora, it’s about as close to paradise as boomer travelers are going to get. At least that’s the way Alan and I feel about this tropical island in the South Pacific. Bora Bora sits about 2600 miles south of Hawaii in the beautiful South Pacific. Part of the Société Islands archipelago, Bora Bora, along with Moorea, Tahiti and several other islands, makes up the French protectorate better known as French Polynesia. Not familiar with Bora Bora? Learn what to expect on a vacation there. 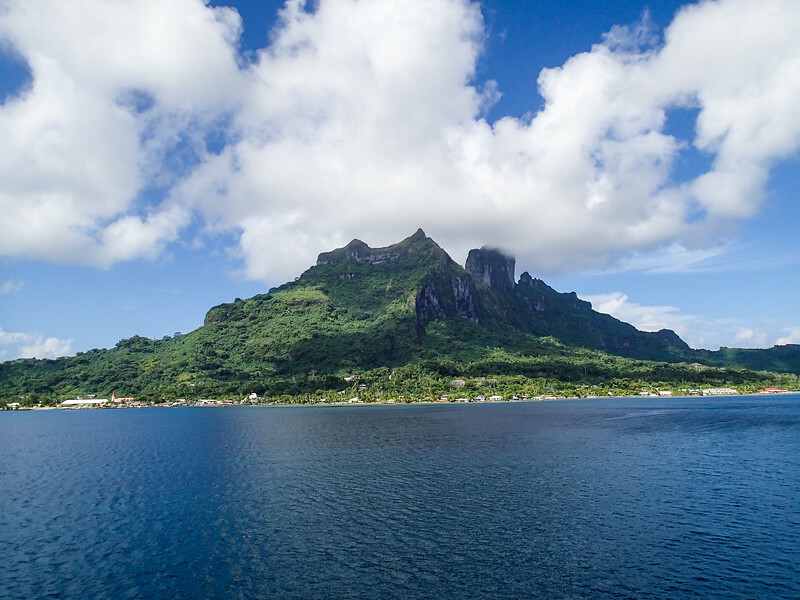 Most South Pacific cruises that meander through French Polynesia stop in Bora Bora. Such was the case when Alan and I cruised with Silversea. Set amidst a turquoise lagoon, where Mt Otemanu overlooks coral reefs and luxury resorts, Bora Bora is simply stunning. And, in our experience, it’s best experienced from the water. On previous visits, Alan and I took the circle drive around the island and also explored the WWII gun installations by four-wheel-drive. This time, the lagoon was calling our name. We signed up for the shark and ray snorkeling excursion, which was the perfect way to experience the lagoon. There’s something for everyone around these islands, find fun activities in Bora Bora on Expedia.ca. After tendering to the wharf, we meet our boat captain and guide for the morning. I recommend choosing morning snorkeling excursions over afternoon ones. You’ll see more because the wind hasn’t had time to pick up to stir up the water like it does on tropical afternoons. As we motor through the lagoon, I appreciate the covered boat awning that protects us from the strong, tropical sun. Glancing toward the shore, I see a resort’s over-the-water bungalows jutting into the water. Now that would be a luxurious way to experience Bora Bora! An assistant sits on the back of the boat serenading us on the ukulele. After about a 10-minute ride, we arrive at deeper water—about 25 ft deep. This is where the sharks live. Guests have the choice of jumping into the water to snorkel above the sharks or peering through the glass bottom of the boat. 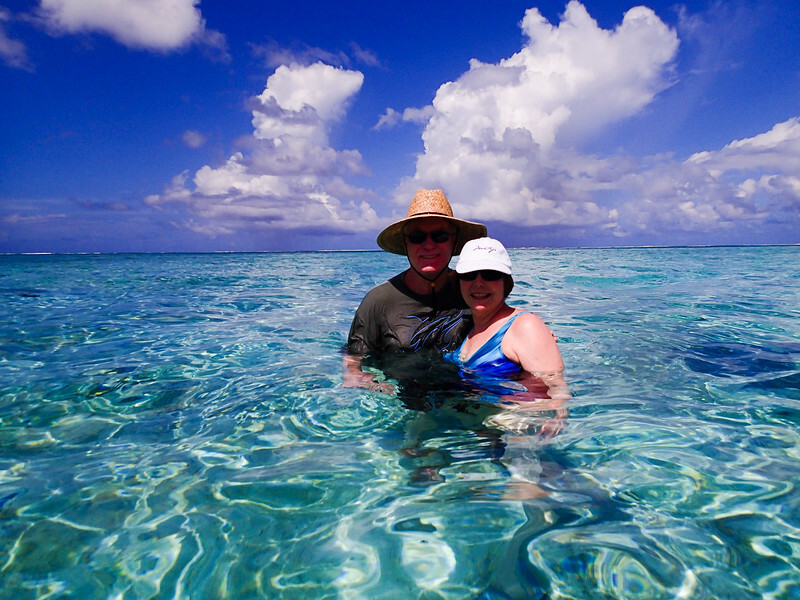 Alan and I opt for the glass-bottom-boat view, as snorkeling here requires a bit more skill due to the current. We weren’t the only guests to make this choice. 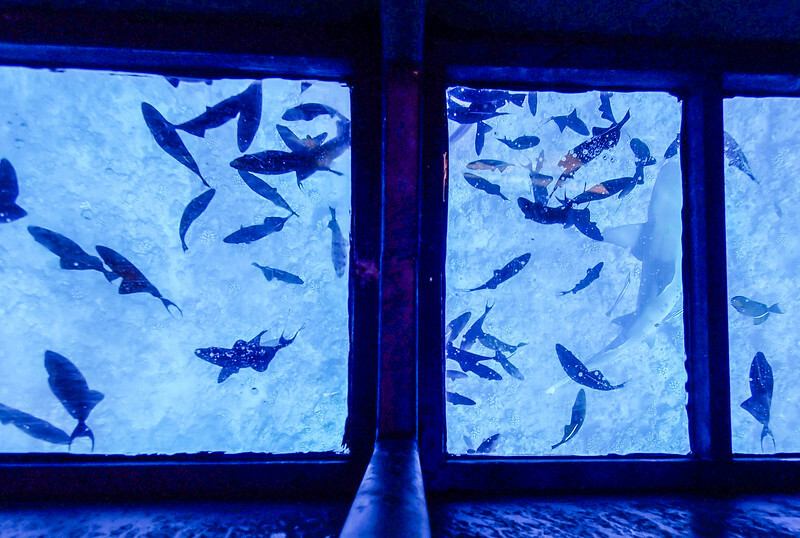 Looking through the glass, we see an assortment of tropical fish and black tip reef sharks. Suddenly a lemon shark swims into view. Whoa! Seeing him from the safety of the boat is just fine with me. Once the snorkelers are back on board, the boat motors to a more shallow area of the lagoon to meet the rays. As I step down the boat ladder, the rays are already there to greet me. 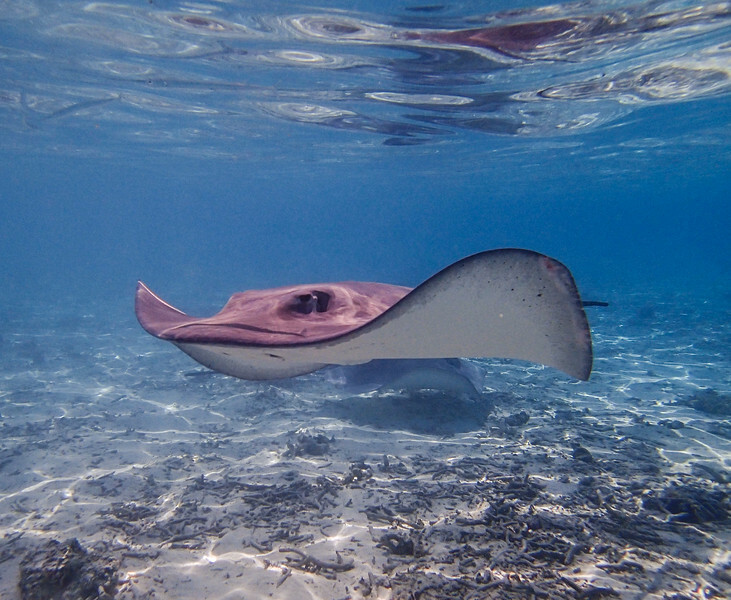 For the next thirty minutes, Alan and I enjoy our favorite activity in the South Pacific—swimming with the rays. Actually, since the water is about chest high, it’s more like walking with the rays. From the description of this Silversea cruise excursion, we knew that no fins would be provided. During the swim with the ray portion of the adventure, Alan and I wore our lace-up water shoes that are great for rocky beaches, water excursions or hiking to waterfalls. Since this was a long cruise with many snorkeling opportunities, we had packed our own masks, partly because Alan uses a prescription mask. However when it comes to swimming with rays, no masks are needed so we left ours on the ship. From previous experiences, I knew that as long as I didn’t startle the rays, I had no reason to worry about their barbs. And because the guides feed them, the rays are actually happy to see and interact with us. I notice more tropical fish surrounding us than I saw on a similar Moorea shore excursion. 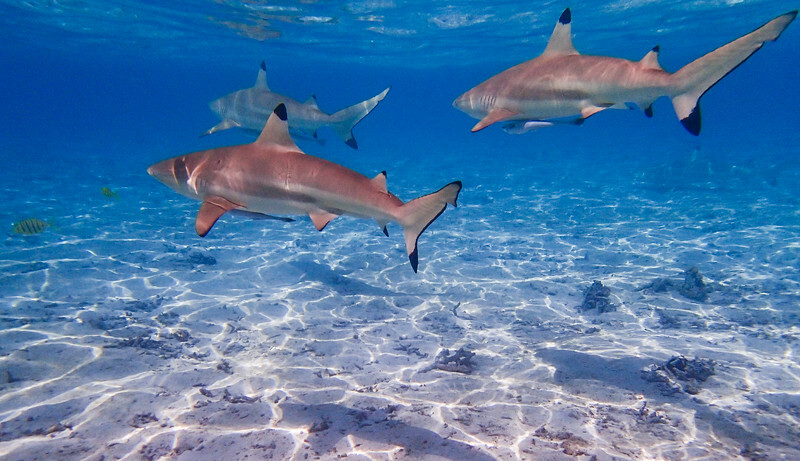 And, of course, the black tip reef sharks hover nearby, waiting to gobble up any leftover chum once we begin climbing the ladder to the boat. As the boat motors back to the pier, Alan and I marvel at what a perfect morning it has been. There were just enough clouds in the sky for great photos of the clear, aquamarine water. We saw plenty of sea life and the rays were plentiful and friendly. As I’m always looking for more places to travel, Expedia.ca offers some great guides like this one on top Canadian destinations for baby boomers.